On our way home from Seagrove Beach on Saturday, my husband and I stopped in Jackson, Mississippi to visit my mother at Lakeland Nursing Home. It was the day before Mother’s Day. I usually visit her about once a month now, making the 400-mile round trip in one day, with an hour-long visit while I’m there. 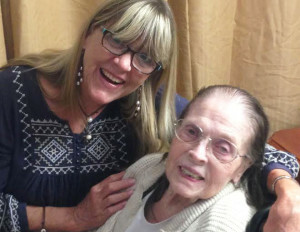 That may not sound like much, but at this advanced stage of Alzheimer’s, my caregiving is different than it was when she was living alone in her home, and later when she was in assisted living. Due to her advanced Alzheimer’s, she no longer knows who anyone is and needs 100% care 24/7. PBS ran a special on Mother’s Day—“Caring For Mom And Dad.” If you missed it, you can watch it online here. The documentary shows several different family situations where an adult child is spending a minimum of 20+ hours a week caring for aging parents. For many it is a 24/7 job. The average age of these caregivers is 49. I began helping Mom in 1998, when my father died. Mom was 70 and I was 47. Now Mom is 87 and I’m 64. 61% of the caregivers in the PBS film are employed, often “sandwich moms” raising a family, working full time, and caring for one or more aging parents. Since 1950 we’ve added more than a decade to the life-span of most Americans. 76 million baby boomers are all going to get old at the same time. 70% of adults 65 and older will need some form of long-term care. How will our children care for us? What is the government doing to help prepare for this? These are a few of the questions addressed in the PBS special. Although my mother has been in a nursing home since late 2008, for ten years before that I was more involved in her day-to-day living: taking care of her finances, eventually cleaning out her house and selling her house and car and moving her to assisted living. Being with her through several hospitalizations. All of this while living 200 miles away and making monthly or sometimes weekly trips to help her. I have so much to be thankful for—especially that she agreed to make me her Durable Power of Attorney and put me on her bank accounts before her dementia had progressed to the point where she wouldn’t have been able to do so. I’m also extremely thankful that Medicaid stepped in when her own finances ran out a few years ago. Although I’ve spent endless hours on paperwork to keep the support coming, it does, in fact, make up the difference between Mom’s Social Security and the nursing home fees. Medicare and Blue-Cross/Blue-Shield pays for her medications and hospitalizations. One daughter in the film said she couldn’t imagine not taking care of her mother at home. She couldn’t imagine putting her in a home. She would feel like a bad daughter. 1. I cannot physically care for my mother 24/7, since she is in a wheelchair, wears diapers, and has a feeding tube. She cannot do anything for herself. 2. Medicaid won’t pay for the in-home care she needs, but it does pay for nursing home care. 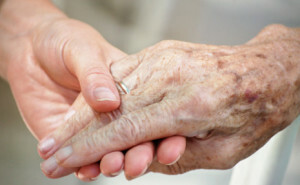 I have two friends who cared for one of their aging parents at home for many years. Several other friends are in the throes of caregiving decisions right now—some are helping their parents in independent living, others in assisted or nursing homes. Each caregiver’s situation is different, and we all need to do the best we can and try not to be too hard on ourselves. It’s difficult enough caring for dependent parents without the added guilt trip. The main thing it to communicate our love for them at whatever level of caregiving. Mother was speaking non-stop nonsense when we stopped to see her on Saturday. She talked about the “trouble” and how “they’re trying to fix it.” She talked about “the colors over there” (pointing towards her window) and how they “just go here and there all the time.” She had no idea who we were, or what Mother’s Day is. But I rubbed her hands, sang to her, kissed her several times and kept telling her I loved her. She smiled a lot and returned the kisses. When we got ready to leave (which is always difficult) she just waved and smiled. But out in the hall a woman kept asking us to please call her daughter to come get her out of there. The urgency and confusion on her face was gut-wrenching. I don’t know her daughter, but I choose to believe that she, too, is doing the best she can. And absolutely no way I could have worked and had a family life without my brothers, husband, children, and a aunt dividing responsibilities and pitching in both spontaneously and on a regularly scheduled basis. Of course being petite, witty, kind, and arriving with a lifetime worth of brownie points and zero unresolved conflict made the task relatively easy. I can’t imagine how one could survive if weight and negative emotions were factors. Thanks for sharing that, Sarah. Of course I knew, but it’s helpful to my readers. And yes, your mother was a joy. Thanks, Mary. It’s never easy, no matter which choices we make for our aging parents. Thanks always for reading and commenting. Oh-h-hh-h, Susan, as one who resides in a “compound” with elderly parents, I know, I know. I’m 65, my husband is 72. Right now, Mom and Dad are both relatively healthy and they live in an apartment attached to our house. Dad is still tending a quarter-acre garden! But there is cooking (making sure they eat healthily at least part of the time), cleaning (and we have help), maintenance on the physical plant (Thank God for my husband, Dave! ), chaffeuring (Dad voluntarily stopped driving last year at age 85), doctor visits (average 3/month…and then there are mine and Dave’s…. ), grocery shopping, and, most importantly, the things we do to recognize their dignity and independence. The time commitment is 24/7 and the emotional toll is astounding. I don’t know what the future will bring in terms of caregiving, but I’m not regretful of any decisions we’ve made, and we have the best arrangement I’ve ever seen. However, this is my major point: No one–no one–needs point at any children/caregivers and say, “I would never do it that way.” So what? We all do it our way–and, as you said, we do the best we can. Bless you, Diana! My caregiving has not been as difficult as many. God love you!